The power and proliferation of mobile devices are not new concepts. But stepping back and evaluating the mobility market and its staggering numbers – and what it all means for unified communications – can be eye-opening. Mobility and its influence on the UC market was a focal point of Google’s keynote address last month at Enterprise Connect. Google for Work’s technology evangelist Adam Swidler said mobile devices are causing a “wonderful disruption” in the way we live and work. Swidler cited a study by Benedict Evans of Andreessen Horowitz called “Mobile is Eating the World,” which has some revealing findings. Namely, smartphones and tablets have far surpassed laptops and PCs in sales and shipments – and the changeover has been rapid and dramatic. Mobile devices are now nearly half of all consumer electronics sales. The mobility market has seen dramatic growth since 2007 when the iPhone launched. Android launched a year later, and the iPad was released in 2010. Part of what’s fueling mobile growth, said Swidler, is the refresh cycle for mobile devices is usually every two years, while users may buy a new PC just every five years. With the advent of iOS and Android, Microsoft in particular has been significantly disrupted from its leadership position, said Swidler, citing the Evans study. In early 2009, Microsoft was on more than 90 percent of the personal computing devices that were sold. 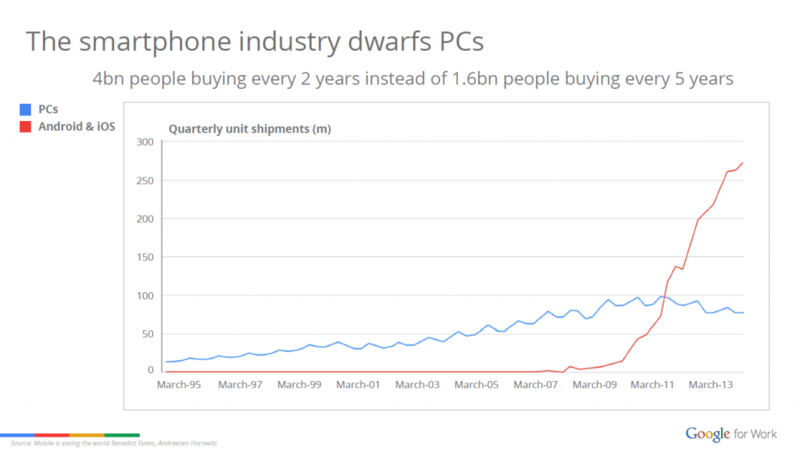 Since then, with the popularity of iPhone and Android devices, Microsoft now represents less than 25 percent of the devices sold. This dramatic shift, according to the Evans study, is expected to continue over the next five years as another billion people come online – and virtually all of them will do so on smartphones. Additionally, a younger generation of workers, who grew up with mobile technology, will only add to the mobile momentum as they join the workforce in the coming years. Teenagers, noted Swidler, simply don’t use email today and don’t make or take phone calls. They text. So what does this mean for UC? Swidler cited research by Steven Sinofsky, former president of Microsoft’s Windows division, on how mobile technology fosters a culture of “continuous productivity” and impacts organizational structures. Mobility, said Swidler, puts a focus on faster problem-solving and execution among team members. Mobile technologies can also allow outside perspectives into your organization – and that’s a good thing. This mobile modernization is also inverting company launches and collaboration, said Irwin Lazar, vice president and service director at Nemertes Research. Google’s presence at Enterprise Connect this year was intriguing. The Internet giant didn’t have a new product to pitch, and they didn’t even have a booth. This year, however, marked the first time Google delivered a keynote address at the conference. 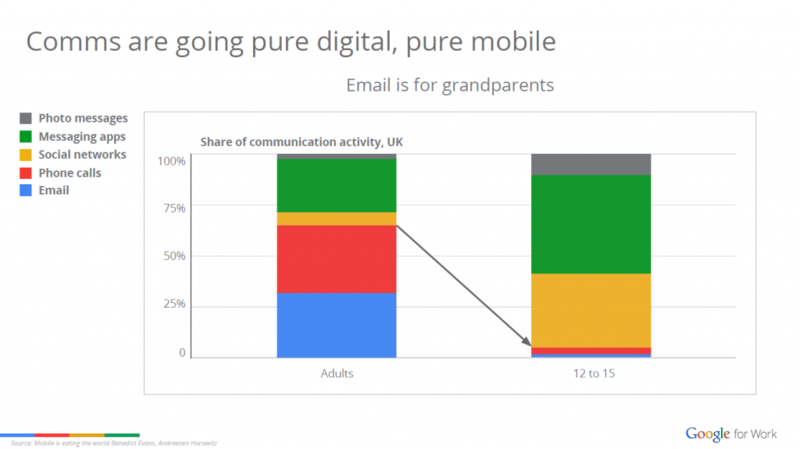 So it makes you wonder if we’ll be seeing more from Google in the business communications space. Don’t expect Google to rival Cisco or Microsoft in the UC market, and I would guess Google is fine with that. Google’s focus perhaps might be just on small businesses – and there are plenty of those. Small businesses, after all, probably can’t afford a big, expensive video conferencing service and would opt for Google Hangouts instead. In his speech, Swidler did spotlight some of Google’s achievements in the business communications market – most notably Hangouts and Google apps.